Safety is the primary concern in the operation of these air boats starting right with their custom design. Earlier versions of commercial air boats (many of which are still being used today by other commercial operations) have low seating, closed tops and partially obstructed operator positioning. All of the Loxahatchee Everglades Tours vessels on the other hand, are upseated which not only gives the passengers a much better view, but also decreases the hazards caused by low lying debris or vegetation. Unlike many other commercial air boats, the captains seat in all of our boats is located behind and above all of the passengers – thereby allowing the captain the unfettered ability to view the wildlife and other boat traffic, as well as being able to keep an eye on every passenger at all times. As mentioned above, these boats are custom designed to protect the environment. The propulsion systems on all of our boats are able to turn two propellers (instead of one) at a slower (safer) speed with reduced propeller noise and reduced exhaust emissions. The custom hull design of these boats significantly limits boat sliding on turns and attendant damage to the plant life. Of course, safety and environmental consciousness are of little importance if the passengers are not satisfied. This is why special measures have been taken to accommodate the needs, desires, and comfort of our passengers. Similarly, each passenger is provided with headset style hearing protection for the “louder” parts of the journey. The “up seating” design, discussed earlier, also allows all passengers a greatly improved view over standard commercial air boats where only the first row of passengers has an unobstructed view. Though such nicely equipped air boats cost more to build and maintain, Loxahatchee Everglades Tours believes the increased benefit – both in terms of safety, environmental responsibility, and passenger satisfaction – more than outweighs the cost. 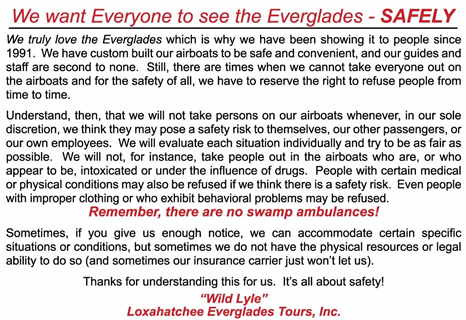 Safety is Loxahatchee Everglades Airboat Tours #1 concern. Our boats are put in and taken out of the water every day for fueling, detailed cleaning and inspected for any repairs. Each morning before any tours begin we launch, test run, perform all safety checks (steering, rudders, oil level, running temperatures, etc.) and conduct a test drive; all of this is done before 7:15am each day. We have 6 different types of airboats based on capacity and 12 different boats in all. We put 3 airboats in the water every morning, minimum, which are all checked in and out of the water by at least 3 different staff each day. On more busy days we may prepare and have ready up to 6 different boats all ready to go in the water. We begin to seat our first passengers as they arrive by 8:30am each day (7:30am for private tours). The first trip of the day boards before 9:00am and we load and return in 50 minutes (or longer for other tours). As we get busier during the day we add more airboats to the line. If a boat fills up before the next hour then we add another boat into the line, and so on. We only tour when weather, water and business conditions are permitting.